Encapsulation of Flight VV07’s passengers is highlighted in these three photos. At left, one of the payload fairing’s half-shells is positioned around the payloads, seen in an image looking upward from the VESPA dispenser system that contains PerúSAT-1. In the photos at center and right, the two-piece payload fairing is closed up to complete the encapsulation process. 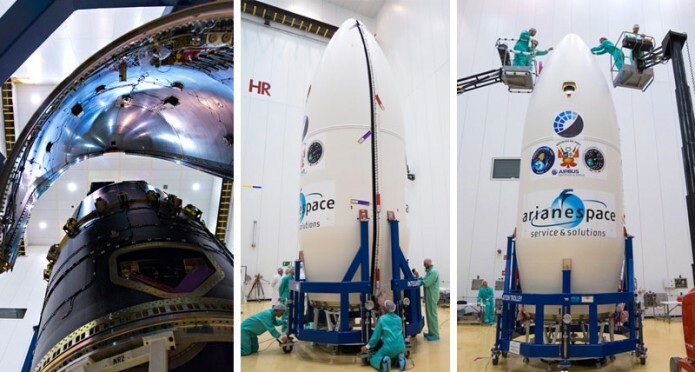 The passengers for Arianespace’s upcoming Vega flight are now encapsulated in their protective fairing. This component will shield the mission’s PerúSAT-1 and Terra Bella satellites during initial climb-out from French Guiana on September 15. Encapsulation, performed in the Spaceport’s S3B preparation facility, marked completion of the payload integration phase for Arianespace Flight VV07, which will place the Peruvian Earth observation and Terra Bella spacecraft into elliptic low-Earth orbits. The satellite passengers’ arrangement places PerúSAT-1 – a very high resolution optical observation spacecraft developed for Peru’s CONIDA national space agency – in a dispenser system called VESPA (Vega Secondary Payload Adaptor). Terra Bella’s spacecraft are in the upper position atop VESPA. With the satellites now encapsulated in the payload fairing, this upper component of Vega – referred to as the “composite” – is ready for installation atop the launcher early next week. During the September 15 mission, separation of the payload fairing will occur approximately four minutes into the flight, once Vega has ascended through the atmosphere’s denser layers. Flight VV07 is scheduled for a nighttime liftoff from the Spaceport on the seventh launch overall for this lightweight vehicle. Vega is part of Arianespace’s launcher family that also includes the medium-lift Soyuz and heavyweight Ariane 5. The four-stage Vega is delivered to Arianespace by Italy’s ELV, which is production prime contractor. To date, Arianespace has conducted six of 11 missions targeted for 2016, with Flight VV07 to mark the first liftoff with its Vega launcher this year. Flight VA228, on January 27, orbiting the Intelsat 29e telecom relay platform aboard an Ariane 5.